You are here: Home / Uncategorized / Free Ice Cream at Ben & Jerry's!! Free Ice Cream at Ben & Jerry's!! LOL that picture kills me. That will be me and my children on March 23…. why you ask? 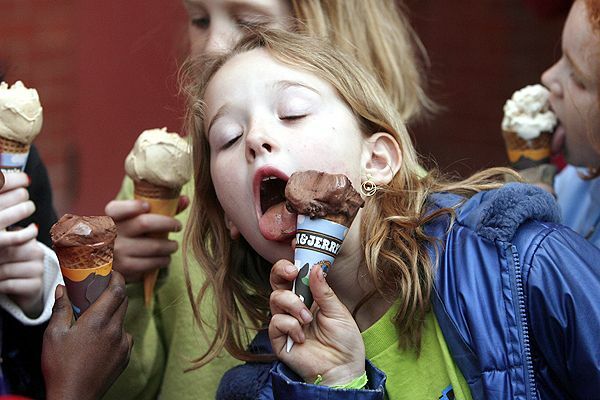 Because On Tuesday,March 23, you can get a free cone from Ben & Jerry’s from noon-6pm. What makes this deal even sweeter is that it looks like you can get in line as many times as you wish. Not much better than unlimited free ice cream! Woohoo! The Ben & Jerry’s Facebook page has more details about Free Cone Day! Here is the Ben & Jerry’s shop locator to see if you have one close by. And dont you fret, I will be posting a couple reminders!! Well if that is a Karrie post, you will have to drive a long ways for a free ice cream cone! Hmm, we always attend but that’s my due date. Think we’ll make it? I hope not!